I don't think anyone ever managed to get autofocus to work on enlargers; at least not in a way that really caught on. But a lot of people spent serious effort trying. The problem was you'd bring up an image, focus it, and then decide to crop it. So you'd shift the head up or down and that would throw the focus off, and you'd have to focus it again. Then tweak the cropping, then focus. If the cropping was critical, it was a pain to get them to match up. The D3 pictured here has a metal fin that runs along the column, and there's a cam that rolls along it that's mechanically connected to the lens cone. So if had it in focus once the board automatically adjusted itself as you raised or lowered the head. The big problem was that you needed that special fin that was matched to the lens you were using; if you had a different lens, it wouldn't work. 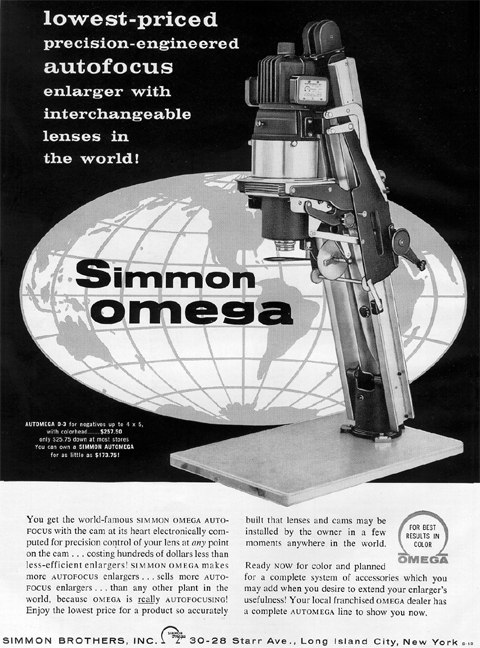 I've got this enlarger and it has three fins, but I don't have any of the lenses to match up to them.